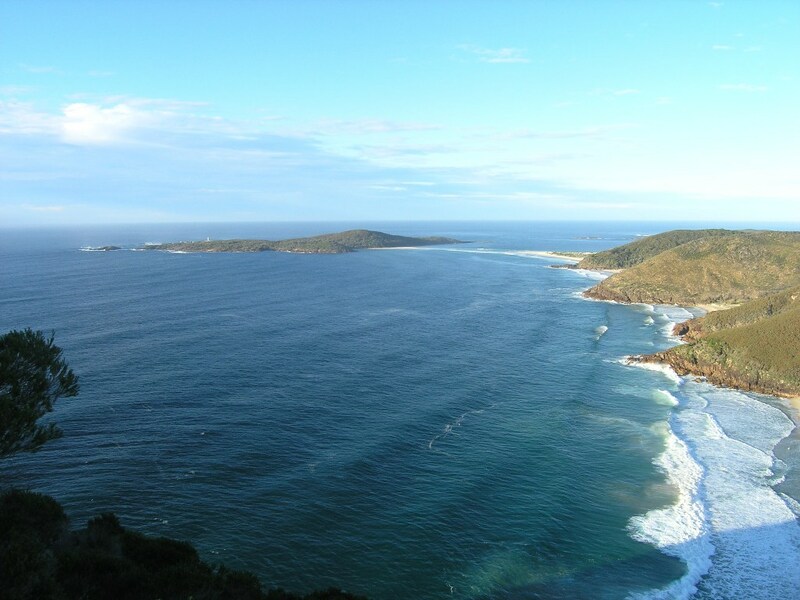 Fingal Island is just off the coast of Port Stephens on the New South Wales central coast. The island is connected to Fingal Bay, one of NSW’s most beautiful beaches, by a sand-spit at low tide. There are a number of divesites around the island with water depths ranging from 5m to 25m. The bottom consists of rugged broken up slabs and granite boulders. The shallows are dominated by urchin barrens and isolated stands of kelp. As you head deeper sponges and other invertebrates start to appear. During spring Fingal Island hosts aggregations of one of the cutest of all shark species, Port Jackson Sharks, or PJs as they are affectionately known. Large numbers of PJs can be found aggregating along the northern side of Fingal Island, particularly in Gantry Bay. This bay is the site where the Government Wharf was situated, which was used for restocking the lighthouse on the island. The sharks can be located by anchoring in Gantry Bay and descending to the base of the island wall where rocks meet sand at a depth of about 10m. Head towards the western corner of the island, and in amongst the rocks are several areas where PJ sharks can be encountered in very large numbers. The presence of the PJ sharks, and their egg laying activities, attracts predators to the area. You can expect to see small stingarees, large Smooth rays and Eagle rays, and very large Wobbegong sharks, some approaching 3m. It is also well worth exploring the shallow areas of the site at the end of the dive. The shallows are mostly urchin barrens, with lots of long spined urchins, but there is also the outcrops of coral and stands of kelp. Hanging off the rocks there is usually a big school of Silver batfish, plus schools of Yellowtail and Pomfred. In summer near the coral outcrops there will be tropical fish that are trying to stay warm in the shallow waters. Common species include Moon wrasses, Cut-ribbon wrasses, Gunther’s butterflyfish, Neon damsels, and Black-spotted goatfish. On the north-eastern corner of Fingal Island lies Shark Island and just out from this island in ~20m of water lies some fantastic sponge gardens. The bottom here consists of a ridge which comes up to a depth of around 12m and is capped by a stand of kelp. On each side of the ridge are deep gulleys with walls covered in sponges and gorgonians. The area teams with fish life and the sponge gardens are a treasure trove of invertebrates. 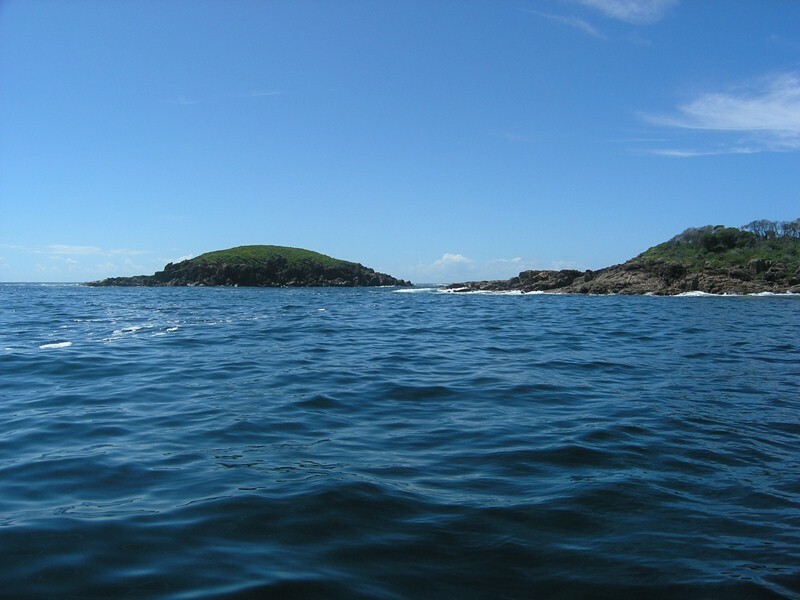 The southern end of Fingal Island is exposed to the prevailing southerly winds and swell, but when winds are from the west or north, and make a mess of the bay, the southern end of Fingal Island can be very calm and clear. In these conditions the island can be accessed by launching a boat directly from the beach at Fingal Bay. The inside of the island is fairly close to the local coast, and the bottom consists of large rounded granite boulders with every crevice crammed with long-spined urchins. As you head towards the outside of the island the bottom starts to drop away and the round boulders gave way to large pillars of rock with crevices and swim-throughs. Isolated sponges cling to the rocks and shells and Nudibranchs crawl over exposed surfaces. Fish life consists of the usual temperate reef species with schools of Yellowtail and Silver Batfish circling in the open water. 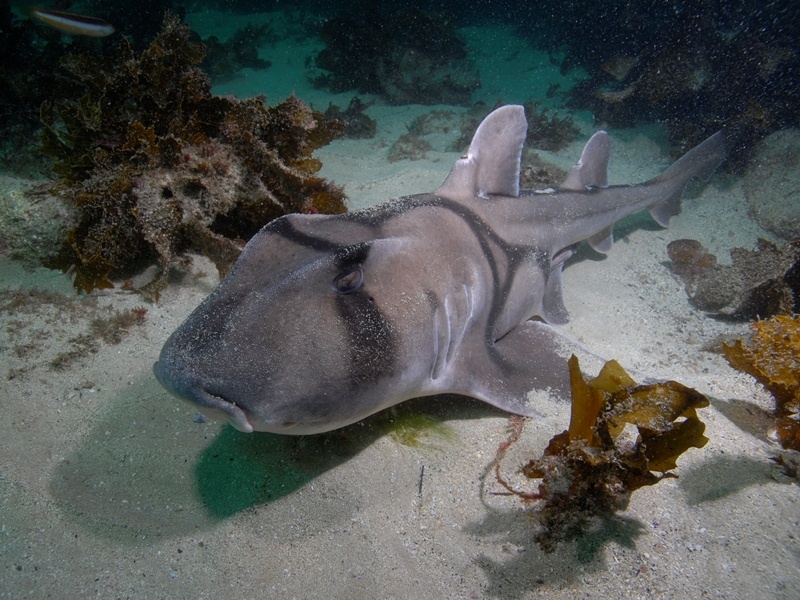 Port Jackson sharks congregate here in spring and Wobbegong sharks can be found all year round.